Emily Pauline Johson was born 10 March 1861 on the Six Nations Reserve (near Brantford, ON) at the Chiefswood family home. Her father, Mohawk Chief George Henry Martin Johnson (Onwanonsyshon), built this impressive home for his bride, Emily Susanna Howells – the house boasted a unique dual-entrance design, with one door facing the road, and the other facing the Grand River (for access by canoe). On her father’s side, Johnson’s grandfather, Chief Sakayengwaraton – or John “Smoke” Johnson) -- was a gifted orator and accomplished warrior. As the youngest of four children, Johnson enjoyed a middle-class upbringing and was educated mostly from home; she attended the reserve school for two years, and then Brantford Collegiate Institute from the ages of 14 to 16. In 1877, Johnson returned to her family home and spent her time in leisure, visiting with friends, canoeing on the Grand River, and enjoying her freedom before marriage. When her father died in 1884, the family could no longer afford to live at Chiefswood, and thus relocated to a smaller home in Brantford. Johnson, now 23 years old and unmarried, decided to try her hand at writing and began publishing her poetry in periodicals including Gems of Poetry (New York) and The Week (Toronto). By 1886, her reputation was growing, and she began signing her work with both her English name and adopted Mohawk name, Tekahionwake – taken from her great-grandfather, Jacob Johnson. In 1892, Johnson delivered a captivating recitation of “A Cry from an Indian Wife”, which began her career as a performer for the next 17 years; she travelled throughout Canada, the United States, and England. 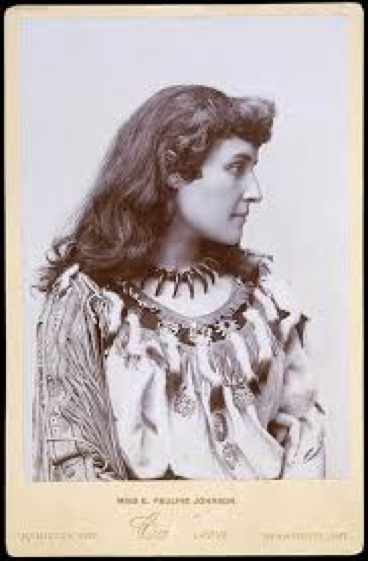 Often, during these performances, Johnson would appear onstage wearing her Native costume for the first half of the program, and then change into an elegant gown for the second half, thereby encapsulating the dual identity of E. Pauline Johnson, Tekahionwake. In 1894, Johnson published her first book of poems, titled The White Wampum, which was met with great success. Johnson moved to Winnipeg after the death of her mother (1898), and was briefly engaged to Charles Robert Lumley Drayton. It has been speculated that Johnson also had a brief relationship with her manager, Charles Wuerz, in 1900. In 1903, Johnson published her second poetry collection, Canadian Born. She retired from the stage in 1909, moved to Vancouver, BC, and began focusing more on producing prose for periodicals including Mother’s Magazine, Boy’s World, and The Vancouver Daily Province. Many of the stories published in these periodicals were based on her friendship with Squamish chief Joe Capilano (Su–á-pu-luck), whom she met in London in 1906. When she became ill with breast cancer, friends and supporters endeavored to publish a collection of Johnson’s prose stories to raise funds for her medical treatment. This collection was titled Legends of Vancouver, and was first published in 1911. A collection of her poetry, titled Flint and Feather, was published in 1912 under similar circumstances (and both collections remain in print today). There were also two posthumous prose collections published the following year -- The Moccasin Maker, which includes many stories from Mother’s Magazine, and The Shagganappi, a collection of stories from Boys’ World.